Frank Winterstein is both excited and proud to be part of the Toa Samoa squad again for the upcoming Rugby League World. The young man from Safune, Saipipi and Vaipuna couldn’t have been more proud after his late selection for the Toa Samoa squad. Frank Winterstein is currently playing for the Manly Sea Eagles N.R.L. club in Australia after three years in Rugby Union. “I guess it was good transition back to Rugby League after three years of playing Union at Japan and Australia sevens team,” he said. 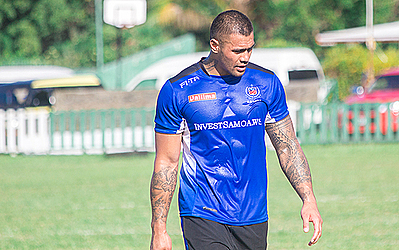 Frank Winterstein last played for Toa Samoa in the 2013 Rugby League World Cup, before joining the Rugby Union. “I am very excited and proud to be able to join the Toa Samoa squad again for this year’s Rugby League World Cup,” he said. Frank Winterstein said the trip back to Samoa was a great idea. “It is also good to come and have our training sessions in local parks to let the community come and push us for our campaign”. Frank is not intimidated by the teams in their pool but instead he said he had confident in the boys. “I also believe that if we play the best we can, surely we can match them up because I know we are there to make up the numbers, we are there to compete for the best we can,” he added.